Once again we are ready to deliver the best boot spots from the weekend; this time we present very new colourways, brand new boots and, of course, the concept boot Nike GS 2. Have you spotted something that we may have forgotten, then feel free to share it with us in the comment box just below this story. 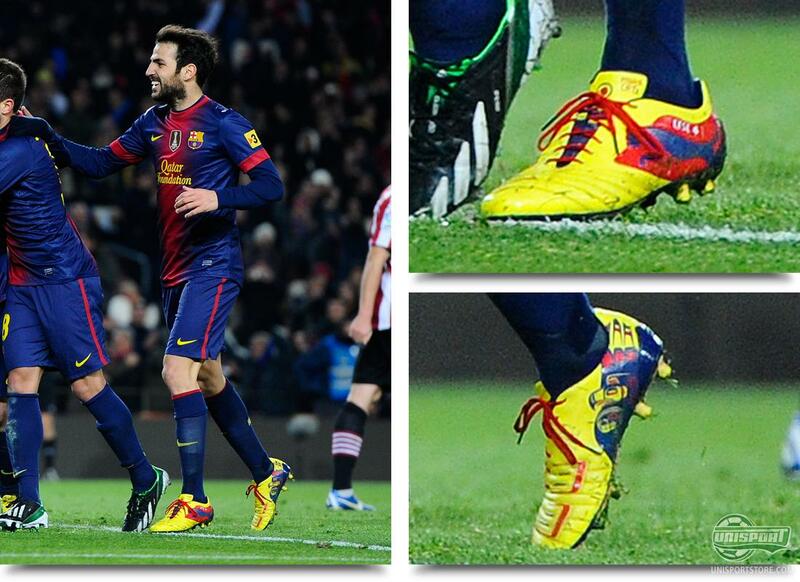 Cesc Fabregas (Barcelona)  Puma Powercat 1.12 Yellow/Red Graphic Just over a week ago Puma's power boot landed in a new colourway, but the German sports brand seem to have an ace up the sleeve for their Spanish midfield general. When Atletic Bilbao got a serious beating, one of our super sharp users, Rasmus Lundegård Larsen, spotted Fabregas in an unforeseen colourway of his Puma Powercat 1.12 with a unique design that combines the colours from the Spanish flag with the colours of the FC Barcelona kit. It might very well be, that the previous Arsenal skipper will be the only Puma star who will be wearing this boot  What is your opinion? 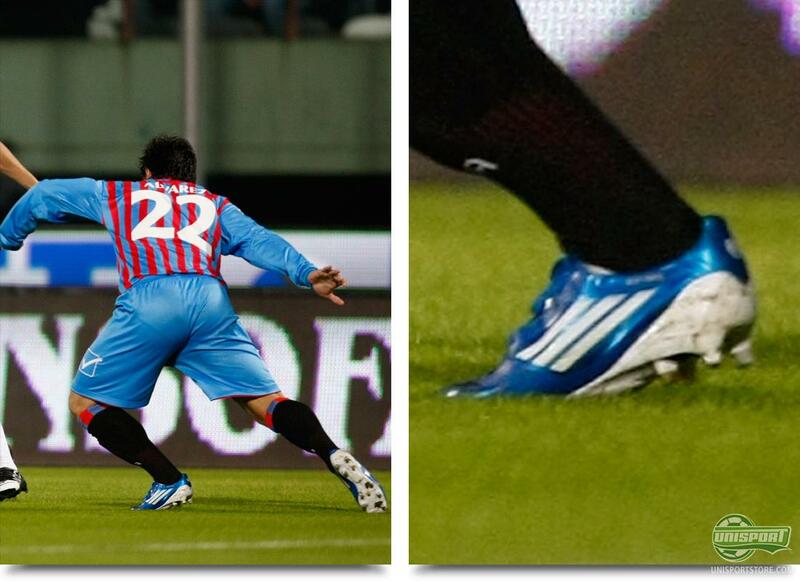 Pablo Alvarez (Catania)  Adidas F50 Adizero miAdidas Blue/White In the Italian serie A we also saw some boot spots worth mentioning, and a good one was delivered by the gentleman right here, who has designed his very own Adidas F50 Adizero. He just misses a little red accent colour and his boots would have been similar to our very own Less is More colourways, exclusively designed by Unisportstore. Stephan El Shaarawy (AC Milan)  Nike GS 2 ACC White/Black The starlet from the big Italian club once again delivered for his team as he found the back of the net twice when Catania were beaten. 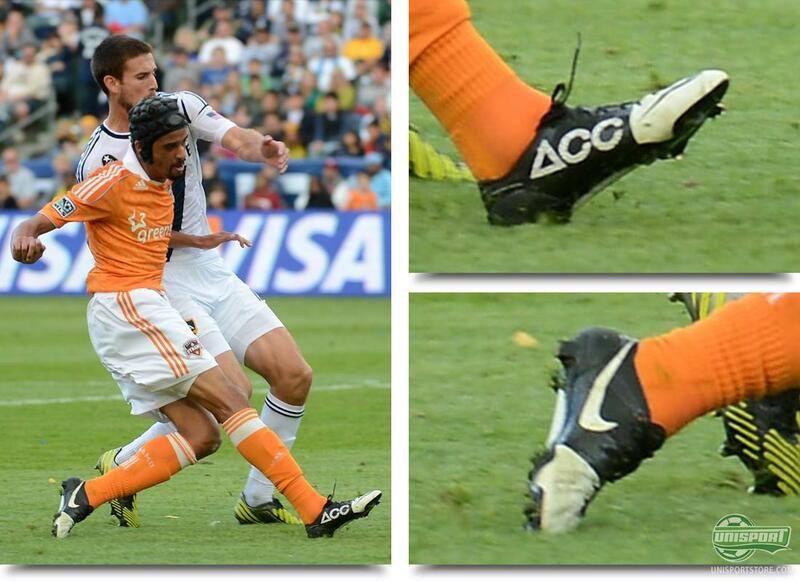 So far we have seen him sticking to his Nike Mercurial Vapor VIII ACC Retro/Total Orange/Challenge Red, despite his spot on the exclusive #GS2SQUAD, but during the weekend he had finally put on the concept boot Nike GS 2 ACC White/Black. 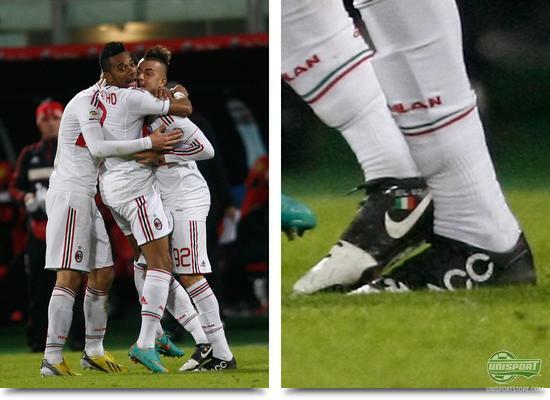 He, hereby, added two extra goals to the goal total of the concept boot Nike GS 2 ACC White/Black, so let's see if he will continue wearing this boot for the Champions League games coming up. Megan Rapinoe (USA)  Nike GS 2 ACC White/Black The 160g super light concept boot is also showing up in the Americas, where a couple of Americans have gotten their hands on the brand new boot; and we certainly enjoy following the American women's national team. 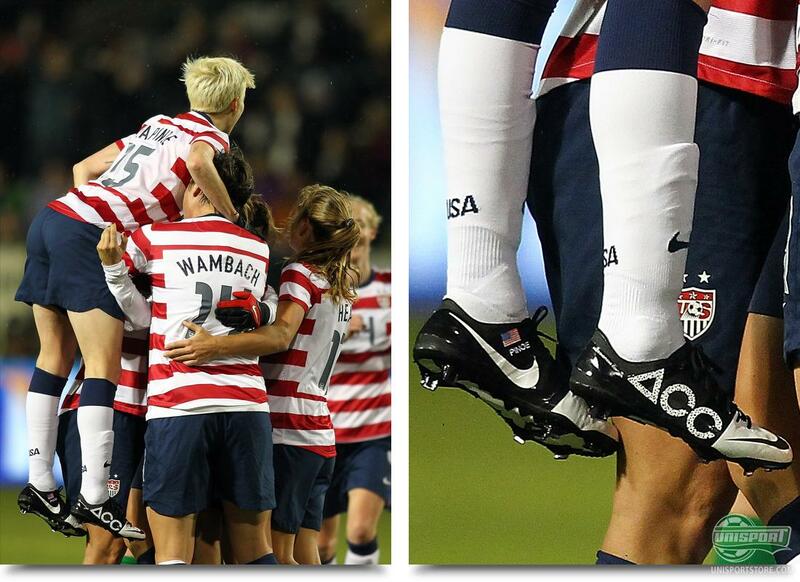 It was also in this regard that we spotted Megan Rapinoe wearing a pair of Nike GS 2 ACC White/Black with embroidery, flag and the works. In addition, we have noted that she has had a Vapor VIII outsole and stud configuration put on her boots. That is quite a customisation, and, so far, we have not seen anyone else do that. Calen Carr (Houston Dynamo)  Nike GS 2 ACC White/Black That was not the only pair that had made their way to the USA, because Petr Cech's slightly darker brother (...not!) had also gotten himself a pair. He showed them off against LA Galaxy with David Beckham in the team and we are very impressed by how many players have taken to using the concept boot. On top of the technical advances, when compared to the first Nike GS, we also think it notable, that the first was meant more as a collectable, where as the second, the Nike GS2 ACC is meant as a boot, to be used and enjoyed. Mario Götze (Dortmund)  Nike GS 2 ACC White/Black The stage was set for Germany's biggest derby, when Bayern Munich hosted the defending champions from Dortmund, at the Alianz Arena. The big stars of the future shone, as Bayern's Toni Kroos drew first blood. It did however not take long before Dortmund's big hope for the future levelled the scores. He did so in his Nike GS 2 and has therefore marked himself as the most loyal #GS2SQUAD-member, as he's yet to be tempted back into his trusted Nike Mercurial Vapor VIII. 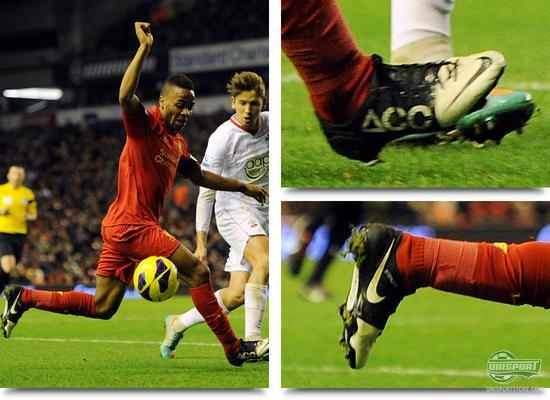 Raheem Sterling (Liverpool)  Nike GS 2 ACC White/Black & Nike Mercurial Vapor VIII Retro/Total Orange/Challenge Red The Merseysides just 17 year-old attacking talent has, unlike formerly mentioned Götze, not shown the same level of loyalty to his Nike GS 2 ACC White/Black. He did start the game against Southampton in the elegant lightweighter, but when the half time break was over, he had substituted them out with his old Nike Mercurial Vapor VIII ACC Retro/Total Orange/Challenge Red. This would indicate that he's yet to break them in completely and might have been getting a bit of a blister. What do you think? Theo Walcott (Arsenal)  Nike Mercurial Vapor VIII Retro/Total Orange/Challenge Red From a very loyal #GS2SQUAD-member, to a kinda loyal and then on to a player, who hasn't even given his Nike GS2 ACC White/Black their début. The Gunner's contract-rebel was otherwise part of the exclusive five, but a couple of weeks in and he's yet to be tempted by the switch. We could about a week and some ago reveal, that Franck Ribery had joined the team and maybe that was at the expense of Walcott? Mikel Arteta (Arsenal)  Puma King Yellow/Black/White Walcott's team mate has in the meantime also found his way to this weeks boot spots, when he gave the new generation of the world renowned Puma King their début. This signalled the end of his spell in Puma EvoSpeed 1 and their lightweight boots and a switch to the updated leather boot, which we actually think suits the elegant Spaniard quite well. Rumour has it that a lightweight version is on the way, so keep an eye on our site in the near future. 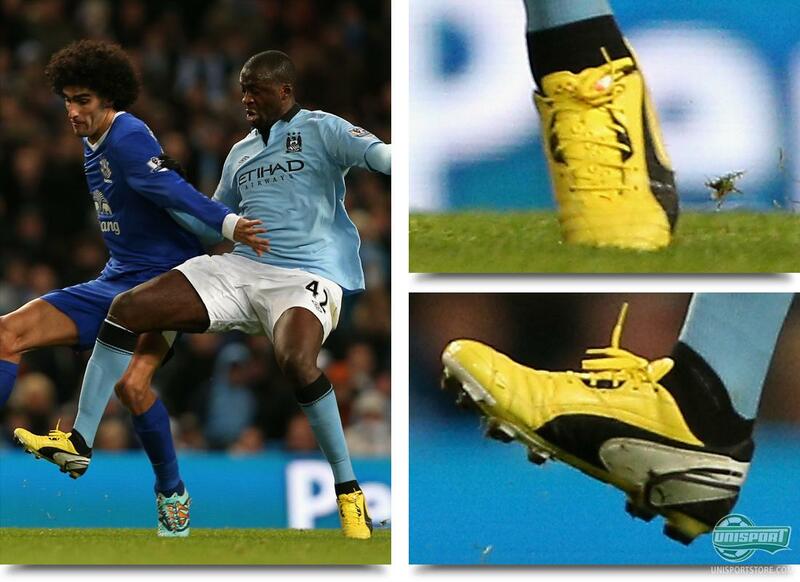 Yaya Toure (Manchester City)  Puma King Yellow/Black Right from the beginning it was obvious that the Ivorian midfielder would be the front-man for the new Puma King Yellow/Black, and after numerous weeks training in blackouts, Toure finally had the opportunity to début his new boots. He did this against Everton, where the reigning champions were saved by a somewhat questionable penalty. The sky blue Manchester club is still hanging on at the top of the table, whereas Chelsea are looking to fall behind. Maroune Fellaini (Everton)  Warrior Sports Skreamer Pro K-leather Blue/Orange As we have come accustomed to, the Belgian with the big hair managed to cause a Manchester team problems. Earlier this season he single handedly won the game against Manchester United and he almost repeated the success against City. He did so in a brand new pair of Warrior Sports Skreamer Pro K-leather Blue/Orange, and we believe that the American brand are quite happy with the boot début. 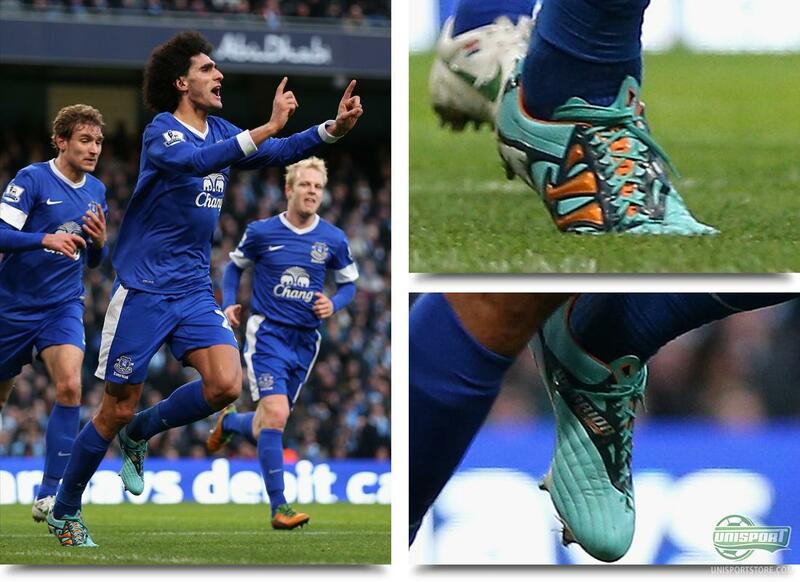 Moreover, it's somewhat strange that Fellaini's boots have an upper made from kangaroo leather, as this colourway is only available with microfibre  gotta love customs. The boot spots from the weekend have included a lot of brand new boots, and especially the last Warrior boot is something we are looking forward to tell you a lot more about in the near future. What do you think is the best boot spot? Did we miss something? Feel free the to share your thoughts in the comment box below.